The Magpies were too good for the Saints tonight, with Jordan De Goey (six goals) again influential. Collingwood was more efficient with ball in hand, finishing with more effective kicks (167123). Another slingshot goal for the Magpies (their fifth of the night) with HoskinElliott on the end of the chain for a game high 11 score involvements. In the final quarter, St Kilda lead the inside 50 count 135, but neither team has scored a goal with the game fading after the seven goal third quarter burst from Collingwood. Jack Steven has teamhighs for metres gained (480), score involvements (nine), score assists( four) and forward 50 tackles (three). Steele Sidebottom is averaging careerhighs for disposals (31) and contested possessions (11) this season. Tonight he has game-highs for disposals (36) and a team-high 16 contested possessions. 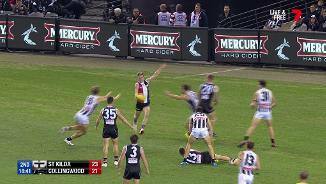 St Kilda has recorded 32 disposal clangers compared to Collingwood 23. The Magpies also lead in kicking efficiency 69 percent compared to St Kilda 61 percent. Jeremy Howe has again been prominent in disrupting the ball movement of the opposition. Howe has a gamehigh ten intercept possessions and has also added four tackles and three spoils to an offensive contribution of 25 disposals. St Kilda has recorded ten missed tackles tonight, which is the most it has committed in a game this season. Collingwood leads the tackle count 4938. Magpies InterchangeTaylor Adams off due to an injury. Collingwood has now scored 4.4. (28) from 19 forward half intercepts while St Kilda has scored 1.3. (9) from its 14 forward half intercepts. Saints InterchangeNathan Brown and is possibly out for the game. Saints InterchangeHunter Clark off due to an injury. Despite leading 3323 in first possession wins at stoppages, the Saints trail the clearances 26-28. Jack Crisp has 601 metres gained from his 22 disposals for Collingwood. No other player on the ground has more than 375 metres gained tonight. A careerhigh sixth goal to Jordan De Goey gives the Magpies a game-high 28 point lead at three quarter time. Collingwood recorded kicking efficiency of 80 percent in the third quarter compared to St Kilda 56 percent. Scott Pendlebury now has a gamehigh nine score involvements (including the last goal), from his 22 disposals tonight in another classy performance. Collingwood has dominated possession in the third quarter, leading disposals (9151) and marks (39-14). Both of the goals to the Saints this quarter have come from centre bounce clearances in which they lead 51 this quarter. Tom Phillips has a game high 19 effective disposals for the Magpies including the last goal. Phillips is averaging careerhighs for disposals (26) and metres gained (383) this season. 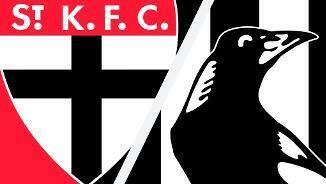 St Kilda has now scored 4.6. 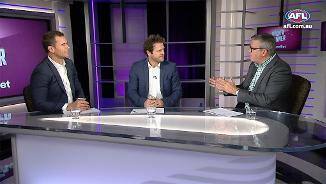 (30) from its set shots at goal tonight, while Collingwood has scored 3.4. (22) from its set shots at goal. While the inside 50 count is relatively even (4136 in favour of the Magpies), Collingwood lead forward 50 marks 10-7, forward 50 tackles 11-2 and forward 50 disposals 41-23. The Magpies have answered a run of four goals to the Saints with four of their own. De Goey has been the target of eight kicks inside 50 by Collingwood tonight, which is more than any other player on the ground. In the third quarter, Collingwood lead marks 143 and effective kicks 23-8 with the Saints having challenges maintaining control of the ball. Another lead change with the Magpies generating that goal from a forward half intercept. 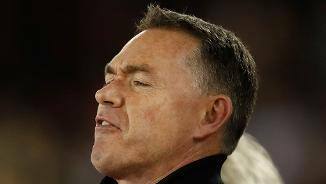 Collingwood has now scored 2.2. (14) from its 12 such intercepts, and averages 30 points from 24 forward half intercepts. Two score assists and five score involvements now to Daniel Wells who has used his 11 disposals at 91 percent efficiency. This season teams have converted 75 percent of attacking midfield chains into inside 50 entries. Tonight the teams have converted a combined 25 of 26 such chains into inside 50 entries, with both teams struggling to disrupt opposition ball movement. The unlikely goal scorer in Jack Newnes makes it four goals in a row to the Saints, and the first goal of the night from a centre bounce. St Kilda averages just 4.6 points from this source (ranked last). Both teams have been able to generate more goals from defensive half chains (four each) than from forward half chains. This season these teams rank first (Magpies) and second (Saints) in percentage of scores generated from defensive 50 chains. The Magpies won the territorial battle in the second quarter (time in forward half 65 percent) and inside 50 entries 189, but St Kilda was able to score an efficient four goals from these entries in this quarter. St Kilda leads the looseball get count 24-14, which is an area Collingwood is ranked second last at this season. Despite trailing 1619 in clearances, St Kilda now leads 19-14 in scores from stoppages. The Saints have averaged only 16 points from this source in 2018. Collingwood lead the clearances 116 in the second quarter, with three of these coming from Steele Sidebottom who has also contributed 12 disposals this quarter. St Kilda has now scored 3.1. (19) from eight chains started in the defensive midfield. Collingwood has scored just 0.2. (2) from seven such chains. Collingwood lead 73 in both contested marks and intercept marks. St Kilda is ranked second last for contested mark differential this season. A careerhigh three goals now to Jack Newnes who in his previous 121 AFL games had only kicked multiple goals on three occasions. A terrific tackle and goal from rising star Jaidyn Stephenson gives Collingwood a gamehigh 15 point lead. The Magpies now lead 8-2 in forward 50 tackles. Magpies InterchangeAlex Fasolo and is possibly out for the game. 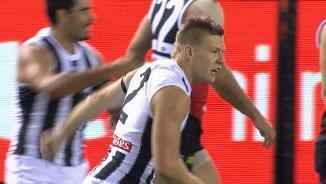 Four first half goals to De Goey, and three goals now to Collingwood from defensive 50 chains. The Magpies have generated 25 percent of their scores this season from such chains (ranked first). The last four clearances and three inside 50 entries have gone the way of the Magpies who are also winning time in forward half this quarter (78 percent). The dangerous De Goey again on the scoreboard for the Magpies, with their first goal of the night sourced from a forward half intercept. Collingwood averages 30 points from 24 such intercepts. The Saints lead the contested possession count 125 in the second quarter, with Luke Dunstan and Seb Ross both up to a game-high seven contested possessions. A second goal to Newnes and this was the first of the night to the Saints to be launched from a stoppage. 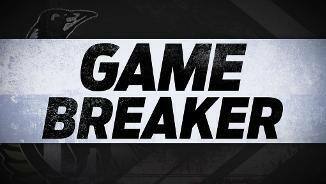 St Kilda now leads 62 in hitouts to advantage and 15-5 in first possession wins at stoppages. 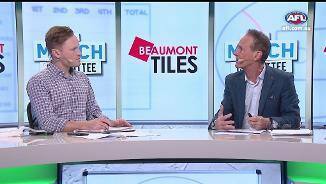 St Kilda had won a total of nine quarters this season prior to tonight, which is the secondfewest of any side. An even first quarter with contrasting ball movement evident. Collingwood leads 2712 in short kicks, while St Kilda leads 50-37 in handballs, and also has a small 35-30 advantage in corridor disposals. The accurate set shot from Jack Newnes capped a chain launched by a defensive midfield intercept by Jarryn Geary. St Kilda has scored from 19 percent of its defensive midfield chains this season (ranked second). The Saints lead 134 in first possession wins at stoppages, but have only been able to convert this into 9-7 lead in clearances. Will HoskinElliott is one of only three players in the competition to have kicked a goal in each game in the first eight rounds this season. A couple of early set shots misses from Tim Membrey who has shot at goal accuracy of only 30 percent this season. In each of the past two season he has had accuracy of more than 60 percent. A super goal from the classy Jordan De Goey, was again launched from a defensive 50 chain, this time from a Tom Langdon intercept mark. 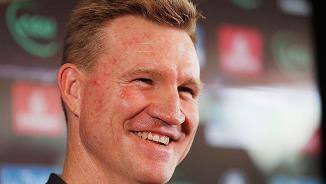 Collingwood leads 41 in intercept marks. The second goal for Lonie and the Saints came from a chain started with a kickin. St Kilda averages just 2.6 points per game from this source. Chris Mayne, who provided the assist for the shot at goal by Varcoe, recorded careerhighs of 25 disposals and 10 uncontested marks last round against Geelong. 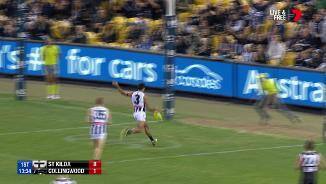 Collingwood gets it first goal through the classy Daniel Wells from a chain that started in the defensive 50. The Magpies average 22 points from such chains this season (ranked second). Four early disposals at 100 percent efficiency for Jimmy Webster including one rebound 50. Webster ranks No.1 at St Kilda for rebound 50s at Etihad Stadium this season with 27, which is 12 more than any other player at the club. The first goal to the Saints came from a forward 50 intercept (their second of the night). St Kilda average just six points per game (ranked third last) from four such intercepts. 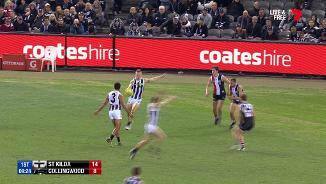 An early intercept mark for Matt Scharenberg. Last week he recorded careerhighs of 29 disposals, 14 marks, 12 spoils and five tackles last round against the Cats. The Saints have lost the clearance count by an average of four and the contested possession count by an average of nine per game (ranked second last in both measures). 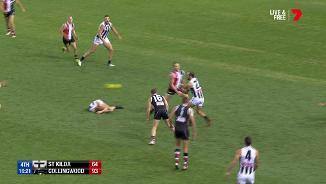 Since 2014, Collingwood has won the contested possession count by 17 per game against St Kilda, which is the best differential recorded by any team against the Saints in this period. Welcome to Etihad Stadium for the St Kilda v Collingwood Round 9 clash. WHO needs a settled pre-season? Not Jordan De Goey, whose rise from the outhouse to the penthouse has continued, with a career-best six-goal haul that helped spark Collingwood to a 28-point win over St Kilda at Etihad Stadium on Saturday night. De Goey missed the start of the season courtesy of a club-imposed suspension and then an injured hamstring, but since his return in round four he has given the Magpies (5-4) an X-factor close to goal that now has them knocking on the door of the eight. The 22-year-old booted three goals in the second term as the Pies kicked away to a 16-point lead, but some quick and direct football got the Saints back in the game and they even took a one-point lead into half-time. But the Pies dominated the third term with seven goals to two to take a firm grip on the game. There was some luck involved, however. 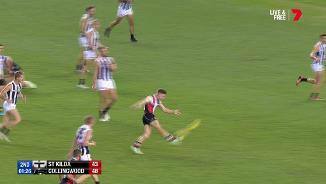 They hit the front at the 11-minute mark following a goal to Josh Thomas after a missed free kick to St Kilda youngster Nick Coffield for an arm chop. 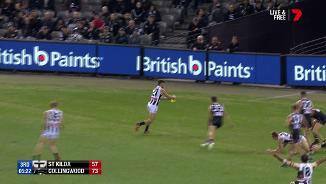 From the bounce Collingwood got the ball to Daniel Wells who goalled with the assist from Will Hoskin-Elliott, who should have been penalised for a hold on a St Kilda defender. And De Goey then got his fifth major when the Pies swooped on a dreadful kick from St Kilda’s Rowan Marshall that badly missed his target. The youngster wasn't just dragged from the ground but was taken into the tunnel behind the interchange bench to be spoken to by coach Alan Richardson, who spent the evening coaching from the boundary line. 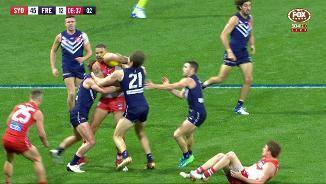 Somewhere, former Saints coach Ken Sheldon, who did the same to Craig Devonport, also against Collingwood in 1992, would have nodded his approval. By and large, the Saints (1-1-7) could not be faulted for their energy. And for that brief time in the second term they played brave and direct footy that for a few minutes, had the Pies on the back foot. But they couldn't sustain it for long and their field kicking didn't hold up for long enough. And they were wayward in front of goal once again, unable to apply enough scoreboard pressure when they held the edge. With key forwards Josh Bruce and Paddy McCartin again watching from the stands, they needed Tim Membrey to straighten his kicking, but he finished with 0.3. Officially, he has the yips and it was left to Jack Newnes with a career-best four goals to provide a target. Only once this year have the Saints kicked more goals than behinds. 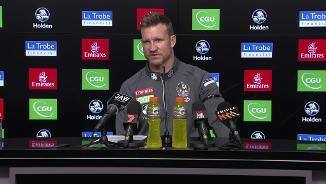 Collingwood welcomed back skipper Scott Pendlebury and he glided through the midfield with 30 possessions and a superb left-foot snap in the third term as the Pies kicked away. Steele Sidebottom was prolific with 38 possessions, while Jack Crisp and Jeremy Howe, with 30 touches each, provided great drive from half-back. Apart from Newnes, Luke Dunstan (32), Seb Ross and Jack Steven (both 29) won plenty of the ball for the Saints. But it’s not much good getting the ball if you can’t use it properly. 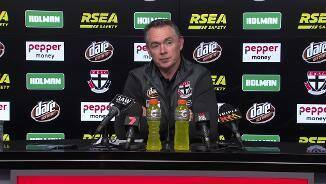 It has been the story of St Kilda so far in 2018 and there isn’t much evidence to suggest it will change any time soon. “They took their opportunities, we didn’t and we were disappointed with that facet of our play,” coach Alan Richardson said. St Kilda: Key back Nathan Brown suffered a medial ligament strain late in the third term and is set to miss a couple of weeks. Collingwood: More ill-luck for small forward Alex Fasolo who will undergo scans this week to learn the extent of a syndesmosis injury. It was his first game back for 2018. No let-up for the Saints, who are at the MCG on Saturday afternoon to play ladder-leading Richmond. The Pies are back at Etihad on Friday night – as the home team – to take on the Western Bulldogs.